We’ve officially made it through the first year of our active learning pilot program! 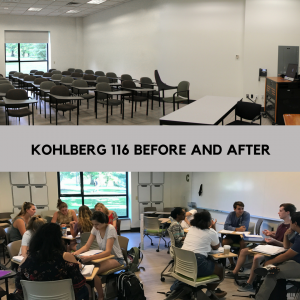 As some of you may know, over the Summer of 2017, ITS teamed up with facilities, the Provost’s office, and other faculty to make modifications to Kohlberg 116 in order to create an infrastructure to support active learning and support innovative teaching methodologies on campus. We designed the room to provide our community with a small-scale version of the active learning classroom being designed for the new BEP (Biology, Engineering and Psychology) building. In doing this, we are trying to help prepare others as well as ourselves on what to expect for teaching in an almost 80 seat active learning space in the BEP building. 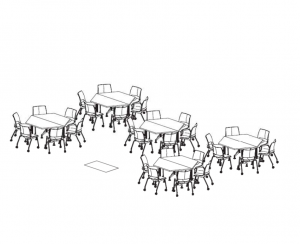 We also think it is important for us to be able to experiment with different classroom furniture and layouts that could help increase student engagement and success. To date, 17 faculty have taught in Kohlberg 116, our official Active Learning Classroom (ALC), and so far, their feedback is not all bad. Not all the faculty that taught in the space used it as an ALC. We are still trying our hardest to work with the Registrar’s office in scheduling faculty who are interested in teaching in an ALC specifically. However, because some classrooms are limited in capacity across campus, some faculty were assigned Kohlberg 116 who did not wish to teach using active learning pedagogy. With that being said, the faculty who did use the space as an ALC overall, had some good things to say. We surveyed the faculty and some reported that the chairs with wheels made it easy for them to split into groups and transition from one activity to the next. The small whiteboards were good for note-taking during discussions as well as for using them for presentations during class. The impact this teaching style had on students was overall much more engaging and interactive. There were some drawbacks as well. We received some feedback that the room is a bit busy with all the new technical equipment. Some faculty also thought it’d be nice if there were iPads in the room so students wouldn’t always have to use their own equipment to connect to the projectors. Also, because each projector worked independently of one another, there was no way to redirect input from one projector to the others. As a result of all of our feedback, we are working on several improvements for Kohlberg 116. Some of the improvements will include, modification to the control system to be able to project to more than one projector. We are also looking at adding a small rack of iPads for the room, taking away some of the small whiteboards to declutter a bit, and adding a pop of color to the walls to warm up the space. As we move forward with looking at different learning spaces on campus, we have been working together with some Science Center faculty to outfit Science Center room 264 with different tables and chairs that would help to facilitate more group activity. We are looking at trapezoid tables that would be similar to the tables that will be used in the BEP building. At this time, there are no plans to incorporate any additional technology. The new furniture layout itself will help faculty better prepare for teaching in BEP with such tables and it will help us understand what’s needed to support such efforts. In our continued effort to learn and grow from our experiences with this initiative, Mike Jones and I will be facilitating a panel discussion at the LACOL (The Liberal Arts Consortium for Online Learning) 2018 Consortium-wide Workshop held at Carleton College next week. The purpose of the session is to start a discussion about active learning spaces at liberal arts colleges and explore if there is an opportunity and mechanism through LACOL to share approaches and lessons about the design, technology, and support of these classrooms. We love to hear feedback from you! If you are interested in teaching in Kohlberg 116 please reach out to us at acadtech@swarthmore.edu. Also, fill out our interest form. If you are even interested in incorporating active learning principles for your classes outside of these designated rooms or in the futre please reach out to us as well. We also will be offering workshop opportunities to learn more about active learning in these spaces at the beginning of next semester so look out for more details!